Heart disease is the leading cause of death for both men and women, according to the Centers for Disease Control and Prevention. This month, the American Heart Association is bringing more awareness to this worrisome statistic by celebrating American Heart Health Month. So how do you overcome this statistic? While, you may not be able to control genetics or hereditary factors that may lead to heart disease, some small changes in your everyday life can make a big difference. 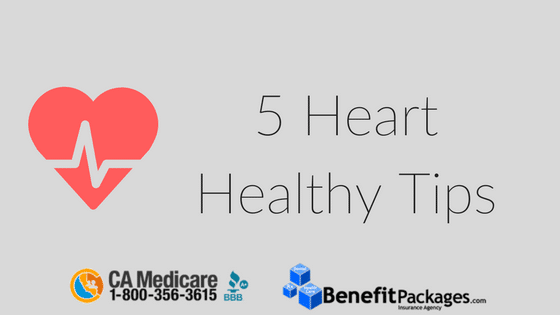 Here are 5 steps you can take for a healthier heart in February and beyond. Schedule regular visit with your doctor. In our previous blog post, the more money to see your doctor, the less you’ll go, even if you have a chronic condition such as diabetes or heart disease, we found that patients with deductibles, both low and high had a significant reduction in visits to both their primary care physician and specialist. A few carriers offer Chronic Special Needs Plan (CSNP) designed for those on Medicare to best meet chronic conditions. If you live in California, you should consider a plan that caters to your specific needs. We can help. If you are already visiting your doctor regularly, always take your medication, and discuss with your doctor different action plans if your medication is causing side effects. Add some sort of exercise to your daily schedule. This is already a given, but most people overlook how important exercise is to keep your heart healthy. Exercise shouldn’t be a tedious task. Find some type of exercise you love and stick to it. Even walking everyday can make a huge impact on your health. For some extra motivation, get a Fitbit. Fitbit’s are a great way to track your steps and heart rate. You can set manageable goals, at first, and then work your way up to more challenging ones. We won’t give you the generic suggestion of eating healthy, but instead maintain a goal to cook at home, at least 3 times a week. By cooking at home, you can reduce your sodium intake and control ingredients, such as oil, and butter. Cutting sodium out can be easy. Next time you cook your favorite proteins, look for these seasonings and herbs to swap in your favorite meals. –Mrs. Dash : Mrs. Dash has plenty of salt free seasoning blends, marinades, seasoning packets, and table blends to keep your meals tasting delicious, without the sodium. -21 Seasoning Salute from Trader Joe’s. This is a great alternative to everyday cooking and has a lot of herbs. Another given for maintaining a healthy heart, but instead of trying to manage all your stress at once, give yourself some daily mindful minutes to manage stress now. Mindful minutes are moments in your day where you set aside whatever you are doing or working on to take some deep breaths or step outside. This is especially important is you work a desk job. Start by setting an alarm every two or three hours to practice 5 mindful minutes. Maintaining a healthy heart required maintenance, but as we stated before, if you having to pay a lot to see your doctor, you might deviate from taking care of your health. This is especially important for those dealing with chronic conditions. THIS WEBSITE IS OWNED AND MAINTAINED BY BENEFITPACKAGES.COM INSURANCE AGENCY WHICH IS SOLELY RESPONSIBLE FOR ITS CONTENT. THIS SITE IS NOT MAINTAINED BY OR AFFILIATED WITH COVERED CALIFORNIA AND COVERED CALIFORNIA BEARS NO RESPONSIBILITY FOR ITS CONTENT. THE EMAIL ADDRESSES AND TELEPHONE NUMBERS THAT APPEAR THROUGHOUT THIS SITE BELONG TO BENEFITPACKAGES.COM INSURANCE AGENCY, AND CANNOT BE USED TO CONTACT COVERED CALIFORNIA. COPYRIGHT Ⓒ 2016. ALL RIGHTS RESERVED. ALL THIRD-PARTY PRODUCTS BELONG TO THEIR RESPECTIVE COMPANIES.